Casa de las Tres Tarrazas, Santa Cruz, is a place for romantics and adventureers seeking rest, reflection and inspiration. Guatemala's famous Lake Atitlan, surrounded by three sentinel volcanos, is one of the natural wonders of the world. Hence why Aldus Huxley referred to it as "really too much of a good thing"! Be warned - once you arrive, you will never want to leave! The Lake views, as well as, the mountain backdrop, are nothing short of spectacular. 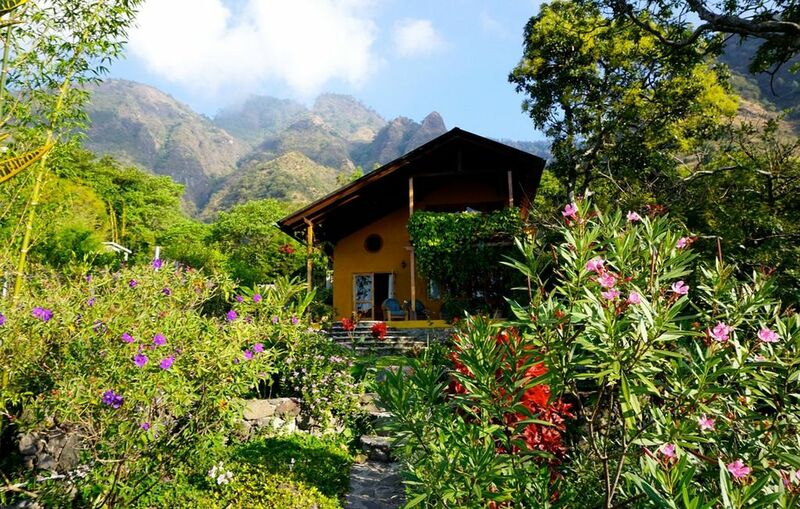 This is a home-from-home providing a great base from which to explore the wonders and magic of Lake Atitlan. There is also a small studio casita, Casa Aguacatel, for rent on the property, but each house has their own privacy. The advantage is that if you have a group of 8, then both houses can be rented together. Please ask for more details about renting the casita as part of the package or on its own. The comfortable home-from-home has 2 double bedrooms with queen size beds and a twin room, a beautiful stone bathroom, a modern, fully-equipped kitchen, cozy living room with a fireplace, and 3 amazing porches. This house is situated in a large, well-maintained, oasis-like private fantasy garden just 5 minute’s walk to the lake shore and 15 minutes walk up the mountain to the village of Santa Cruz la Laguna. The house is accessed from a set of circular steps up to a large terrace with quiet seating area. French doors lead into the main open plan area. The living area with fireplace is two stories high with the fully-equipped kitchen and dining area off to the right. At the back of the room is a large bathroom with a shower, gas hot water and a washing machine. There is also the 3rd bedroom: a twin. Up a wooden staircase is a second double bedroom with its own private patio facing the mountains. Then along the gallery is the beautiful and spacious Master Bedroom with French doors leading to another private patio with table and chairs. The whole house is beautifully decorated and styled to make you feel like it is a home-away-from-home. The only access to Santa Cruz is by boat. However in Santa Cruz all five, nearby hotels have restaurants and bars. You can also take advantage of, scuba diving, yoga, Spanish lessons, kayak rental and guided hikes and tours of the lake. For a writer or artist focusing on a project, for a spiritual retreat, or a family vacation in the heart of the Maya's Land of Eternal Spring, this house is ideal. Lake Atitlan has a temperate climate as situated at 1,500 meters or 5,000 feet above sea-level, hence, "the land of eternal spring"! The area of Santa Cruz is among the quietest around the lake, and boasts the most spectacular views of the sun rise, sun set, AND all-day-long views of all three volcanoes across the lake! Santa Cruz is only accessible by boat (10-20mins from Pana), but is still the closest village to the main transport hub and commercial center on the Lake: Panajachel (Pana to locals). Here is where you find banks, ATMs, grocery stores, delis, cafes, pharmacies, restaurants, bars, and the wonderful local market overflowing with fresh fruit and vegetables. Every Saturday morning there is a small farmers market at the Hotel La Iguana Perdida, by the main public dock of Santa Cruz. Santa Cruz is a Kakchiquel village of approx. 3,000, the village itself it set up a steep road accessible by tuk tuk, pick up, or on foot! Here you can visit CECAP, a vocational center for young people from around the lake, where they learn a multitude of things from cooking, sewing, computer skills, and carpentry. Be sure to check out their café/restaurant with quite possibly the best view of the Lake. The small catholic village church is one of the oldest around the lake. The rest of Santa Cruz runs along the shore, where the five hotels are (Isla Verde, Arca de Noe, La Iguana Perdida, Villa Sumaya & Laguna Lodge), which all provide restaurant meals. Paxanax Bay lies about a 10 min walk to the east of the main public dock along a series of paths (some rocky) and boardwalks, and has its own public dock for access to properties in the quiet and tranquil bay. Always bring a flashlight/torch for night time wanders as no street lights! But please be assured Santa Cruz is extremely safe and secure. Prices are for 2 guests. Any additional guests from 3-6 will be charged at a rate of $20pp per night. Please ask about renting Casa Grande & Casita Aguacatel together. My name is Richard, but at the lake mostly I am known as Rico. My partner, Rae, and I spend approximately 9 months a year living in Santa Fe, NM and the other 3 months in Guatemala. This is a house that I designed and built in 2003. Since then I have upgrades many things in the house and developed a large enclosed flower garden with fruit trees and a corner for organic vegetables. We also have a small casita (460 sq. ft) in the lower garden which we will be renting in the spring of 2016. The garden is a great place for bird watchers! A river is along the west side of the property. Everyone loves this place. Large Shower. Adjourning room has large sink and washing machine. Gas hot water. the most beautiful lake in the world! Not necessary at this climate and altitude of 1,500 meters or 5,000 feet! Large enclosed private tropical garden. Upstairs: Private 12' x 12' porch w/ cypress wood floor facing lake + 8' x 8' balcony w/ tile floor facing mountains + Downstairs: 12' x 24' porch w/ tile floor facing lake. Available to rent near by. A beautiful stay in a lovely home with a fantastic view. This is a well designed and well equipped house in a beautiful garden with a beautiful view in a wonderful pueblo. From the bed in the master bedroom, you look out on the volcanoes and the lake. You couldn't ask for a better way to wake up in the morning. My wife and I stayed at Rico's for our honeymoon, we couldn't have had a better experience. First of all, we know very little Spanish and neither of us had been to the area. Rico was integral to giving us helpful details and preparing us for travel arrangements before we left. He was pleasant and did more than enough to make sure we arrived and enjoyed our stay. The same can be said of Carlos his housekeeper and gardener. He was easy to find and helped us with any request during our stay. Secondly, the property itself is stellar! It is well kept, clean, with stunning views both in the yard and across the lake. My wife particularly enjoyed the large bathroom and shower. The details given on the listing are accurate when we come back will probably contact Rico again. Also, the location is a perfect mix of seclusion and access to all the lake has to offer. We slept with the windows open and every morning awoke to the sounds of the Guatemalan highland coming alive. If you seek reflective peace and quiet or romantic privacy you'll receive both. At the same time, the public boat access is only a 10 minute walk along the lake shore. La Iguana Perdida and ATI Dive Center are conveniently right next to the boat launch. Having our language difficulties throughout the day as we toured the different cities around the lake, La Iguana was our respite to find some English camaraderie. We met travelers and heard stories from all over the world before we headed back to the Casa. Don't forget to bring light for those short walks along the lakeside at night. Another English speaking attraction nearby is Los Elementos Adventure Center. They helped us arrange a tour of San Pedro and San Juan. Only 10 minutes past the boat launch, it was a delightful walk along the lake with many snapshots along the way. In short, our days were filled with activity and culture, our afternoons were spent hashing out our adventures with new friends, and our evenings were spent relaxing with only the volcanoes as company. I recently stayed here with 2 friends. We are all writers and it was an idyllic spot in which to work on our novels, and when we weren't doing that we either went hiking or to the little farmers market on Saturday mornings to buy our groceries or just sat on the lovely patio reading or looking at the beautiful gardens, lake and volcano. Carlos, the guardian, a lovely man, attended to anything we needed. The kitchen was fantastically equipped. We hope to go back again soon!! I stayed here for several weeks with two other writers in February 2015. It was my first time staying at Rico's and I will surely return. The house was just a ten minute walk from the main dock at Santa Cruz and a 3 minute walk for a dip in the lake. I could either feel involved in the local community or be a complete hermit. I divided my time evenly between those two options. The house is clean (super clean!) with inspiring views of the lake. The kitchen is fully equipped for those who like to cook. If you aren't a cook, you can buy meals locally or amazingly, order take out meals from some the of best local cooks who even deliver. We were well cared for Carlos who maintains the property and helped us with all sorts of things like where to buy fresh eggs and how to stay supplied with bottled water. Truly a place to experience. Lovely! This winter, for the fourth time, friends and I booked Casa de Rico, and it was even more wonderful than ever. We are writers who had just led a writing & yoga retreat at nearby Villa Sumaya and needed time to work on our own novels. What a special, private, beautiful place to work, rest, cook, wander, and visit with friends. We are especially fond of Carlos and his family, who care for Casa de Rico year-round. They bring an air of warmth and friendliness, as well as delicious meals prepared by Carlos's wife, Alicia. And we have become especially fond of Alicia's mother and sisters, for their weaving, their hugs and their delightful laughs. Somehow all of this comes with the casa, along with light-filled rooms, a well-equipped cook's kitchen, comfortable beds, a delicious stone-encircled shower, laundry room and best of all, gardens Eden would envy. And, did I mention, a gorgeous view of the lake and its volcanoes rising into the sun? We will surely return. My friends and I just spent another lovely week at Rico's house. This is the second time we've stayed there, and we thoroughly enjoyed it. Rico, as always, was extremely attentive and helpful, as was his caretaker, Carlos. The house is cozy and well equipped and the gardens are lush – it is a little piece of paradise. We hope to be returning soon! Local Farmers' Market every Sat am at the Hotel La Iguana, Sta Cruz. Local Artisan Markets, Spanish Lessons, Massage, & Yoga. Kayaking, boat tours, hiking tours, horseback riding. An extensive Welcome Pack is given to all guests and a hard copy is available in the houses.